>As hoops fans brace for tonight’s potentially epic national championship in the “it’s-not-a-Cinderella-story-will-you-look-at-the-preseason-rankings-PLEASE” between media darling Butler and big bad Duke, it is quite the stretch to theme a Northwestern post around the game. I saw Northwestern alum Dave Revsine in press row representing the Big Ten Network in style at Saturday’s games on TV and I thought – “that’s the best I can do?”. So today, with Norman Dale references likely to be continuing to fly out of the media, including references to Hinkle (now Butler) Fieldhouse replete with Gordon Hayward hoisting some Ollie-like walk-on to measure the rim I figured let’s pull out the memories of McGaw Hall. I’ve always loved Welsh-Ryan Arena. While it lacks the historical significance of Hinkle, I’ve always felt it was unique, and with any semblance of winning tradition would be considered “charming”. With decades of losing it has been relegated by many to simply be a “high school gym”. I always point to Cameron Indoor Stadium, which is a band box of a place that has allure simply because of Duke’s amazing on-court performance. In an era of sterile, look-a-like, on-campus mega-arenas like Kohl Center, Value City Arena or Breslin Center, I’ll take Welsh-Ryan anytime. My first glimpse at the joint was in 1990 when I first visited Evanston. Like any self-respecting sports fan, my college visit had my jonesing to see the athletic facilities so my Dad and I walked down Central Street from the main campus and walked right in to the arena. I loved it. It felt “right” the second I walked in. I had no idea that just eight years earlier, it was a dump of a place that included a dirt indoor track. I always found it ironic that one of NU’s best teams in decades – Rich Falk’s 1982-83 team – played their home games at DePaul’s Alumni Hall while McGaw Hall underwent renovations. 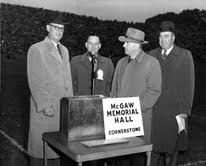 Note the crowd at Dyche Stadium for the October 20, 1951 NU-Navy tilt, also site of the halftime dedication to the new McGaw Hall cornerstone. From L to R: Foster G. McGaw, NU Chaplain James McLeod, NU President J. Roscoe Miller,and NU AD Ted Payseur. From 1977 to 1981, we (the football team) used McGaw for 5AM winter workouts. The only part of the whole place that wasn’t dirt was the basketball floor. We used the dirt track that ran around the field house for ‘Indian Runs’ which we offensive linemen rigged so that no one lineman could (or would dare) go faster than a steady, endurable pace – which we (even today) can invoke with the utterance of a single word – ‘union’. The football staff strategically placed puke buckets on the corners. The tunnels (on the southwest and southeast corners) previously mentioned were quite dangerous for the random passer-by, and I’d argue were there for overhead protection from falling debris raining down from the ‘stands’, as much as anything. The stands were all temporary, and I’m sure in today’s litigious society would be banned. I can recall sitting towards the top and being able to see ‘down’ to what seemed to be miles. Back to winter workouts – we were forced to run up the bleachers, from bottom to top, multiple times, first running, then jumping (two feet at a time), then one legged hopping. Perhaps under hypnosis I could recall the agony of these torture sessions, which were highligted by heading outside, and then into the basement of Andersen Hall, where the wrestling rooms were, for mano y mano wrestling matches. McGaw was a ‘pit’ to put it politely, though the memory of witnessing the NU hoops team upset of eventual national champions MSU with Magic Johnson made it somewhat all worthwhile. For any NU sports alum, who heads back, and walks into the place today, the memory of what it was still overtakes the senses. The infamous indoor dirt track at old McGaw Hall. Welsh-Ryan pays homage to this track with the mezzanine wrap-around jogging track. Photos courtesy NU archives. I was a freshman when Magic Johnson, Greg Kelser and Michigan State came to McGaw in 1979 and received a whuppin’ from the Wildcats that undoubtedly served Coach Jud Heathcote in preaching to the Spartans the rest of the way about the dangers of overconfidence and letting up. Rich Falk’s Cats won only two Big Ten games that season – – his first year on the job – – and yet posted an 83-65 beating of the eventual national champs. Hard to imagine how NU did it, but it was a blast to attend and witness. We were stomping our feet on the bleachers and kicking up a storm from the dirt floor below. 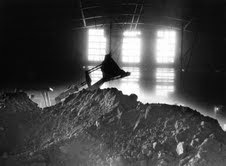 McGaw Hall gets dug up in 1982. Photo courtesy of NU archives. McGaw Hall was a true field house with a dirt floor – i.e. an open enclosed area, that’s it for permanency.. There was no mezzanine level. Seats were principally what would be called temporary seating these days, being just wooden bleacher seats on a metal pipe framework. The student section was the north bleachers and one had to go all the way to the back of McGaw to get in. Leading to the paid, non-student seats on the south side, you had to go through two curved corrugated metal tunnels to each side. The tunnels were curved because they were part of the indoor dirt track. Carpets were put down on the floor in the tunnels and aisles leading to the seats to give it a “finished” look. There was no mid-court scoreboard and what did exist is very similar to the two end scoreboards that are there today The basketball court was likewise temporary and was elevated about 2½ to 3 feet above the floor. 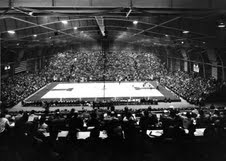 The 1956 NCAA Title Game at McGaw Hall. McGaw also hosted the 1967 Mideast Regional, a game our friend, reader “James” attended. Photo courtesy NU archives. McGaw was the venue for name performer concerts during the mid-sixties. Homecoming always had a name act for Saturday night. Don’t know how long that practicewas in place prior to 1964 or after 1968 but there were some pretty top acts(for the time) including The Kingston Trio, The New Christy Minstrels, TheBrothers Four, The Turtles, Diana Ross and the Supremes and I think (butcould be mistaken) The Beach Boys. Depending on where you take your pieceon historic McGaw, you might want to try to find out who else may have played there. Graduation was also held in McGaw back then. My most memorable moment at old McGaw was the 1967 basketball game between NU and Kentucky. This was the year after Kentucky was in the NCAA finalsagainst Texas Western and featured Pat Riley and Louie Dampier. The game was nip and tuck throughout and neither team had a lead of more than 2 or 3points at any time. The score was 61-60 at halftime (pre-3 point shots soyou can imagine the defense). The game continued the same way for the second half though Kentucky prevailed 118-116 with NU putting in a tying basket a split second after the buzzer. While there have been exciting games at WR over the years, this one still ranks number 1 for me, thoughlike fish tales, it may grow better with each year it is further in the past. keep players from nasty falls while trying to save the ball. So, the story went, Tex got some used pieces of court from Kansas State, where he had previously coached and the color scheme was the same, and drove them from Manhattan, Kan. to Evanston in a truck. I covered the basketball team for the Daily when Tex was still the coach, but don’t recall talking to him about this. Rich Falk might be able to confirm it (or tell you I’m full of it, if I am). I also remember a woman who was on the track team (barely knew her and don’t remember her name) telling me that unsportsmanlike things happened between runners in those tunnels. 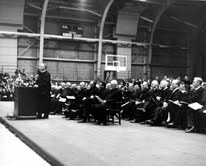 Charles Taft speaks at the McGaw Hall dedication ceremony in 1953. Taft would become the Mayor of Cincinnati and known as “Mr Cincinnati”. Photo courtesy of NU Archives. As a NU student from 1970-74, I attended plenty of events there and covered the hoops team for the Daily, plus as an Associated Press stringer. I also covered the indoor track team (yes, indoor track team) there. It was quite a spectacle to see people running through those tunnels — or running the 50-yard dash along one wall and hitting a big pad on the wall just past the finish line. The coach was Don Amidei, a real old-school Ed Asner type, and he always got a kick of hearing the runners go “thump” into the pad. Anyway, your previous contact is right. The McGaw floor was dirt and the only permanent seats were an upper balcony on the west side of the building. The basketball floor was moved in and out, depending on what else was happening, and was an elevated floor. The basketball locker rooms were located underneath Anderson Hall and a long, dark tunnel (is it still there?) connected the locker rooms with McGaw. The hoops team was full of characters in those days and one of them, Mark Sibley, brought his dog with him to practice and the dog would occasionally wander into the tunnel and do what dogs do. 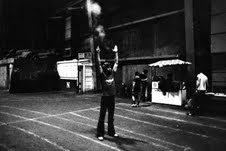 There were also times, after rock concerts by such acts as Sly and the Family Stone, the Byrds, Mountain, Ike and Tina Turner, Janis Joplin, etc., that the dirt floor might turn up the occasional half-smoked joint (because security people caused smokers to abandon the joints mid-smoke?). In terms of hoop greatness . . . well, there wasn’t much of one in my era . . . however, I did see Adolph Rupp coach his Kentucky tean in the building during my freshman year, in a wild loss to the Cats where both teams scored more than 100 points . . .and there were some great upsets. The best was in the 1972-73 season. Minnesota was the defending Big 10 champion and the Gophers also had a great team that season (featuring Dave Winfield, Ron Behagen, Jim Brewer) and they only needed to beat NU on the last weekend in Evanston to clinch a second straight conference title. Remember, these were the days when the NCAA tournament had no at-large bids; only the conference champion went to the “Big Dance.” Northwestern had a typically lousy team that season (finished 5-19 overall and in last place in the Big 10) with only one conference victory to that point, but the players performed out of their minds and scored an unthinkable upset. As a result, Indiana backed into the title (it was just Bob Knight’s second season there and this was his first Big 10 title team) and went to the tournament as the Big 10’s representative and went all the way to the Final Four. That would never have happened if NU had not beat Minnesota. Years later, I was interviewing Bill Musselman, who coached that 1972-73 Minnesota team, when he was working as a NBA coach. I asked him if he remembered that game and he cringed from the memory. He recalled that before the game, he was walking behind his players through the tunnel from Anderson Hall to the arena and he overheard them talking about which agents had been in touch with them in preparation for the pro draft and what the agents were offering, etc., . . . Musselman said when he heard that conversation, he knew the players’ minds were in the wrong places and it wasn’t going to be a good day (it was an afternoon game) . . . So there you have it, some neat recollections of old McGaw Hall. Today Welsh-Ryan Arena sits within McGaw Hall and the present structure was dedicated on January 18, 1983 on a night when NU hosted Bradley and the women hosted USC in a double-header. There have been modifications in recent years, namely to the lockerrooms and practice facility behind the north section. Bill Carmody is lobbying for an upgrade in facilities and I’m going to see if I can connect with the hoops program to spell out exactly what his wishes are. I still contend that consistent winning in Evanston will transform Welsh-Ryan in to one of the most difficult (and loudest)venues in the Big Ten. Just use this season’s Purdue game as an example of what life could be like on a nightly basis. I hope these stories prompt you to share your McGaw memories. Bring them on. This entry was posted in NU Hoops. Bookmark the permalink. >That was a good read. I have to admit when my father first told me about the dirt track at McGaw I definitely did not believe him.